Knowing that the fragile ceasefire could be violated by the illegal factions at any point in time, the Russian media cooked up a story meant to blame Ukraine for the anticipated confrontations. Russia’s disinformation campaign started with the hacking of the website that belongs to the National Guard of Ukraine. Before being hacked, the page looked like this (saved in Google webcache). The latest news article on the page, contained at the address vv.gov.ua/news.php?nid=6871, was removed and replaced with fake news item. The actual article released by the National Guard was entitled “Tank division of the National Guard joins the battle” and was posted on February 14, 2015. Hackers replaced it with a fraudulent posting, while maintaining the photos from the original news release. The fake item was slipped into the same existing page as the original news article (vv.gov.ua/news.php?nid=6871). The bogus write-up was entitled: “Dmytro Yarosh: two of my batallions continue the offensive.” It was dated February 14, 2015, just as the original piece it replaced. Shortly after the ceasefire went into effect on February 15, 2015, Russian media started to blast out the news about Ukraine’s alleged ceasefire violations, based on the fake article that was planted on the website of the National Guard. The story was widely disseminated by Russia’s biggest mainstream media outlets, including RT, Ria Novosti, Itar-TASS, LifeNews and others. These news reports accused the Right Sector of violating the ceasefire. Ukrainian users and organizations (such as Euromaidan) immediately noticed and pointed out numerous red flags about the deceptive news item. First and foremost, the Right Sector and Dmytro Yarosh are in no way affiliated with the National Guard of Ukraine. Aside from the phony piece, the National Guard never ran news releases dedicated to the activities of Yarosh or the Right Sector. Furthermore, Dmytro Yarosh does not have “two batallions” in his command and the Right Sector’s personnel is not located in the area of Debaltseve. The phony news was poorly written in broken Ukrainian, containing numerous mistakes a Russian-speaker might make, if using Google apps to translate Russian text into the Ukrainian language. The hacked webpage listed the date of the phony news item as February 14, 2015, but Russian mainstream media reported it as a ceasefire violation with the date of February 15, 2015. Once questions were raised about the date of the alleged posting on the National Guard’s website, hackers promptly changed the date of the article to February 15, 2015. This only highlighted the fact that the website was being actively manipulated by Russian hackers with the sole purpose of placing the blame for the alleged ceasefire violations on the Ukrainian side. The National Guard would clearly derive no benefit from changing the date on the so-called “news release” to the date of the fragile ceasefire. Russian media and government, on the other hand, used the said bogus article to blame Ukraine for the alleged refusal to honor the ceasefire. The National Guard’s website is still re-building its news section after the hacking. In the best traditions of the Russian media, none of its publications bothered to remove or update their stories. 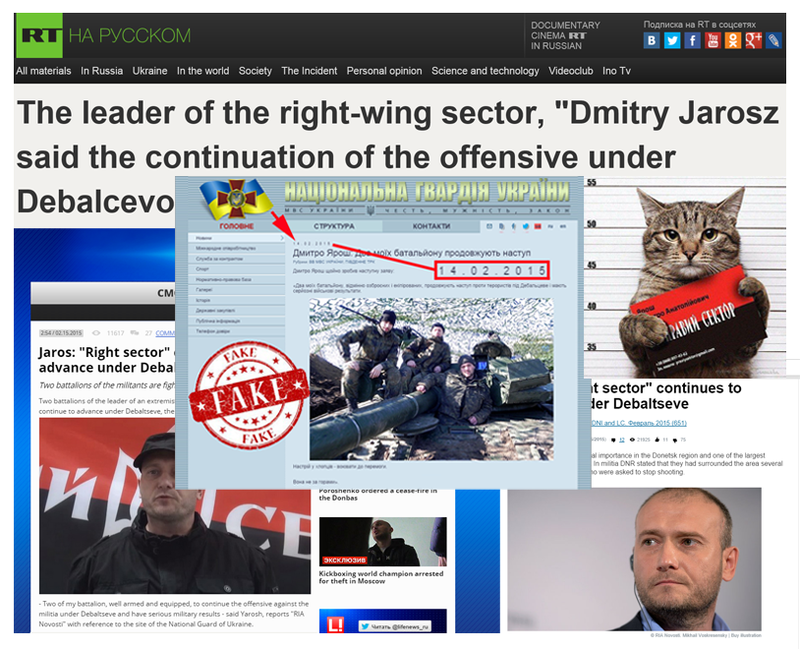 To the contrary, RT falsely claims that the said news appeared on the National Guard’s website on February 15th and disingenuously asserts that the article was removed solely “to hide the inability of the Ukrainian government to control the Right Sector.” The Russian disinformation locomotive continues its steady descent down the muddy hill of shameless propaganda. Russian mainstream media doesn’t publish retractions and knows no shame, regardless of being exposed for countless misrepresentations. The main agenda of the Kremlin-sponsored networks is to litter the information superhighway with so much disinformation that the truth has a hard time getting through. To that end, their mission to deceive, divide and conquer vulnerable minds is quite effective.